Oval top bisecting the front panel for a unique style. Finished in a combination of white and cocoa. 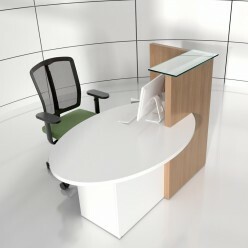 The Slice reception desk has an oval top bisecting the front panel for a unique style. Finished in a combination of white for the body and tops with cocoa for the front panels. includes storage and glass shelf.